With a shifting payer mix toward government and exchanges payers, commercial payers with high deductible health plans, and hospitals reducing or eliminating anesthesia group subsidies, today’s anesthesia medical groups are facing financial challenges like never before. Additionally, we are seeing certain insurance payers requiring anesthesia preauthorizations for GI procedures, which had never occurred in the past. In this environment, it is imperative that anesthesia medical groups stay vigilant, work closely with your anesthesia practice consultants, and negotiate their commercial contracts on a consistent basis. I often meet groups of anesthesiologists that do not track when contracts renew and did not plan future contract negotiations. I even meet with groups that have not negotiated in years, or even EVER for small payers. Anesthesia medical groups need to employ a strategy, with or without anesthesia practice management, to maximize their commercial revenues and make sure they do not miss a renegotiation window with any insurance payers. It’s unfortunate, but groups that neglect this strategy fall behind market rates and may never recover for one or more years of missed opportunities for rate increases. This misstep can cost the group significant revenue over the long term. We suggest that anesthesia medical groups contact the insurance company well in advance of the notification period to start contract dialogue. This can start with a few phone calls or emails, and I suggest a positive and politely worded letter stating that you are providing notice of termination. “We are very confident we can negotiate a new agreement with XYZ Insurance and we fully intend to remain participating providers in your insurance network. In order to comply with the XYZ Insurance contract section 2.8, and to ensure all notices are properly communicated, we are exercising our right to terminate this agreement with 60 day notice. This letter is a way to ensure the group’s request to renegotiate is not ignored and delayed. This notice creates a time frame whereby the agreement must be resolved. What should the group expect as an increase? Prior to making a proposal to the insurance payer, an anesthesia group needs to do their own internal research on what their rates are and what is common in their region. Market Rates – An excellent source of market data is the ASA annual commercial unit rate survey that is segregated by region and broken down by low, median, and high paying payers. Once the group reviews the survey, they can determine if their contract is below or above market rates. Actual Unit Rate – Your current contract states that we will pay you $65 per unit… so that’s it, correct? Wrong… The contract will allow $65 per unit, but what is your actual yield per unit? With high copay and deductible plans, a lot of these allowances will go to bad debt. In essence, your actual unit rate from this payer may be $60 per unit. The insurance company may counter this argument by stating, “This is a sign of the times – too bad”; however, doing your homework shows the insurance payer that you know your contracts and are prepared for your negotiation. If the group is currently being paid in the market range, it seems that insurance payers are willing to accept a 2-3% annual increase and still maintain their budget targets. One way to maximize payer negotiations is by offering a 3 year deal and negotiating a higher rate for year 1 and 3% annual increases the following 2 years. Remember, the keys are to not miss an opportunity, and to seek regular increases to your commercial contracts. 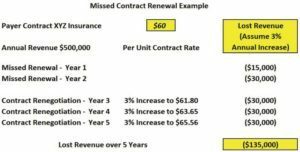 If the group is BELOW market range, which is typically a result of missed contract renewal negotiation opportunities in the past, the group is in a bad predicament. The insurance payers still have the same budget constraints and will argue that it is not their fault the group has not approached them to renegotiate in the past few years, which is a valid argument. Your anesthesia practice management should be consulted in order to figure out what works best. The group can also attempt to get a 1 time bump up rate, then get on a more consistent long term contract. For instance, a 5% increase year 1 and a 2% increase year 2 and 3. Unfortunately, the only way to potentially get this payer to make a big 1 year increase is to threaten and potentially terminate the payer contract. This is a risky venture with major payers since it may violate the group’s hospital contract and alienate hospital administration. This strategy can only be used infrequently, and if the group decides to pursue this course of action, they need to have the support of their facility in order for it to be successful. Once again, consult your anesthesia practice management to see if this tactic would be worth it. When certain payers are small, they are deemed insignificant based on the revenue they generate for the group. Many groups do not renegotiate these contracts, or they accept the rates that were originally agreed upon. Small payers are still part of your payer mix and their rates contribute to your group’s commercial rate average. By diligently negotiating contracts with small payers, you are able to move your overall average up and provide “Blinded” information to the major payers that provides a stronger argument for a rate increase. In general, if the payer is insignificant, then just accept them as a “Non Par”commercial payer. If you have a contract, you should negotiate it regularly. In addition to vigilant payer contracting, anesthesia medical groups may want to consider employing a charge hold strategy for commercial payers. This strategy of holding anesthesia claims is typically 14 to 30 days, and it allows facility claims to be submitted to the commercial payers first so the patient’s high co-pays and deductibles impact the facility charge and not the anesthesiologist’s bill. This strategy has become more prevalent with the average anesthesia practice management company in the past few years, and quite often anesthesia medical groups have experienced a significant increase in revenue and decrease in bad debt. The other advantage to this strategy is that the anesthesia group creates an internal savings account whereby if cash flow is impacted in the future due to unforeseen events (ICD-10, etc. ), these charges can immediately be released to provide the group with necessary cash flow. The short term problem with this approach is a one time revenue reduction in the first year when charges go on hold, but this also can be managed by a gradual hold implementation meaning (for example, you hold charges three days month one, then three more days month two, etc.) until you have 14-30 days on charge hold. With increasing financial challenges to anesthesia groups, working closely with your billing and anesthesia practice management company to plan and facilitate commercial insurance contracting is key to your group‘s long term financial success.